Using essential oils for high blood pressure is not a new technique. On the contrary, it goes back hundreds of years ago when ancient holistic healers made use of these potent essences to improve many aspects of human health. Aromatherapy can offer a safe alternative to the over-the-counter drugs extensively recommended by doctors nowadays. Since the active substance lies in significant amount in these oils, they have an immediate effect and powerful anti-inflammatory, antiviral and antibacterial properties. They also have a great importance for restoring the hormonal balance. Recent scientific studies have shown that essential oils genuinely act on the central nervous system, they help in releasing muscular tension, reduce the pain and adjust people’s emotional state. Aromatherapists recommend the use of essential oils for high blood pressure because they can stimulate the immune system, promote the rooting of new cells in the body, fasten the elimination of toxins, invigorate the function of the digestion system, and overall help the entire organism and lead the healing process. By calming the nerves, these essences assist the body to relax, dilate the arteries, act as antioxidants to decrease the oxidative and emotional stress thus lowering the level of the blood pressure. There are multiple ways to use the oils because they can be absorbed through the follicles (by massaging different areas of the body) or by inhalation. When breathing the lungs get more oxygen, and since you inhale the oils, the molecules will get into the bloodstream. So you may use vaporizers, candles or even add a few drops to the bathtub. 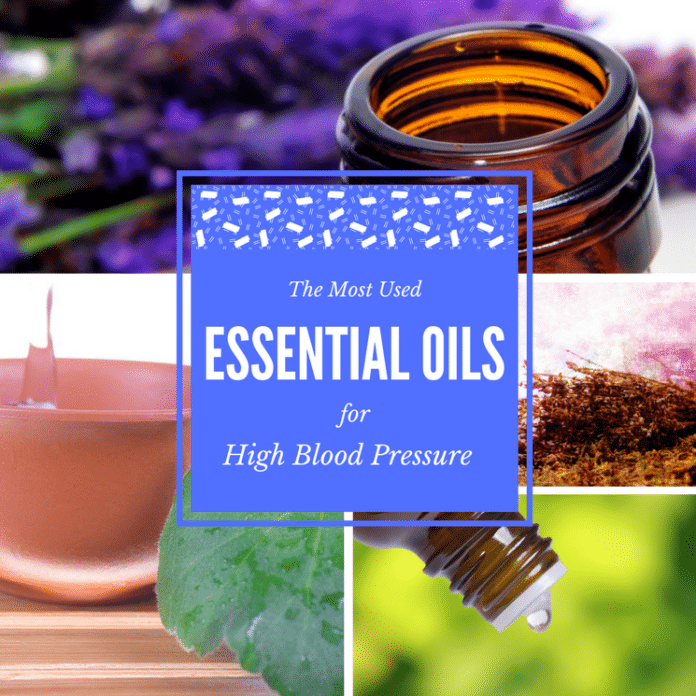 Below you will find a list with the best essential oils for high blood pressure. Lavender is one of the most famous mild essential oils which can successfully invigorate the nervous system and bring peace and balance. People used to name it the “grandmother of all essential oils” due to its calming properties which can work on your emotions and support your body through the healing process. It acts like a charm in case of depression or any other emotional disequilibrium or conditions of the nervous system. Lavender essential oil will decrease high blood pressure by bringing back positivity to your mind and relaxing the entire body. Use a double boiler to bring the coconut oil to its liquid state. Add all the essential oils and stir well. Gently massage the area of the heart and all the vital points every day until you will notice the improvement in your condition. Place the water on the stove and let it reach the boiling point. Pour it into a large bowl, and add the essential oils. Take a soft cloth or a thick towel and cover your head leaning over the bowl. Make sure you don’t burn your face by staying too close to the hot water. Inhale the vapors for at least five minutes before going to bed at night, or anytime you feel stressed or anxious. This essential oil act like a tonic over the entire organism, being rich in alcohols. It brings a warmth sensation and equilibrates any imbalances you might face at some point. Because it has a powerful effect on the nervous system, holistic healers often use it the treat nervous fatigue and even lethargy. It may be possible that you have some obsessive thoughts because of some unpleasant event in your life which increases the stress level. Marjoram can relieve those thoughts and any emotional desires leading to the decrease of high blood pressure. All the daily stress (and maybe some unexpected and painful events) will do a lot of harm to you, and sometimes you may feel overwhelmed by your problems. This is where marjoram can help by taking care of your inner serenity and your mood swings. If you want to enjoy the extraordinary properties of marjoram essential oil, prepare the following salve for high blood pressure. Melt the salve over a double boiler. Stir in the essential oils and whisk well to distribute evenly. Let cool overnight at room temperature. The mixture will get thick again. Massage the reflex points for the heart twice daily. Take a small amount of the salve and rub it gently on the left foot sole, the area under the big toe. Also, massage the area between the left ring finger and around the heart. You will certainly notice an adjustment in your condition in only a few days. Having a mild spicy scent, neroli oil is also great in combating depression. It can lift up your mood when you are feeling anxious and also acts as a gentle sedative. So you can definitely use it if you are facing insomniac episodes. Some other effects of this oil proven through scientific studies and common practice are antibacterial, antistress, analgesic, antiseptic, antidepressant, aphrodisiac, hypnotic, calmative, and it also acts as a rejuvenator of skin cells. It is also extensively utilized for fighting against digestive problems. To fully benefit from neroli’s essential oil ability to lower the blood pressure, you may prepare the following mixture. Use the blend to massage your body after taking a shower. It will widen the blood vessels thus decreasing the blood pressure. Just like the previous oils, clary sage also works on an imbalanced nervous system, restoring the peace and tranquility. Specialists advise you to utilize this oil only if you want to sleep or rest because its powerful effect can alter the sharpness of your mind. It will help you relax and sleep well by calming the nerves and uplifting a swingy mood. It brings a note of positivity and serenity. Transfer the mixture to a diffuser or add it to the bathtub and take a long relaxing bath. Another candidate for the list of best essential oils for high blood pressure is tea tree oil. Its great qualities of an antibacterial and antiseptic agent are well-known. Furthermore, recent research suggested that it is also beneficial for blood pressure and helps in reducing it. Some scientists conducted a study on a group of a few married couples. They were split into two groups: one of the groups received portable blood pressure monitors and the advice of massaging their partners with tea tree oil for about three times each week while the people from the second group had to do nothing but go on with their usual lives. After a one-month trial, the individuals from the first group was reported to have increased levels of oxytocin, the hormone which releases stress. They also noticed that the blood pressure values decreased. The other group didn’t see any change in their condition which is entirely reasonable. Just add two drops of tea tree oil to two teaspoons of sweet almond oil and massage the heart area three to four times per week. Don’t use essential oils during pregnancy or nursing period. They may affect the fetus or even cause a miscarriage. If you follow any of the pieces of advice regarding how to use essential oils or you try any other homemade remedies for high blood pressure but your condition doesn’t improve in two weeks, or you feel worse, ask the help of your doctor. This is a serious condition which may lead to life-threatening side effects.